Audition, Scholarship and State Drama Competition Preparation classes or coaching. I have time to teach a few classes or workshops Thursday afternoons and evenings April – May 2019. I will also offer Workshops this Summer June 24-29, July 15-20, and August 5-10. Please respond to jenny@actingoutloud.com with requests of what you would like to take most. The new expanded slate of classes and workshops will begin early August 2019 with the Shakespeare Competition team. ​ The Peterson Studio of West Jordan, Utah is proud to present Acting Out Loud. This program is based on our philosophy that an actor’s body, voice, and mind are the greatest tools in acting and they need specific development. Our students are taught to be bold in their movements, confident in their voice and intelligent in their character development. Acting Out Loud offers levels of advancement that will individually challenge students and increase acting talents. Classes cover the spectra of skills including; Movement, Voice, Characters, Monologue Performance, Scene Performance, Group Performance and now Musical Theater. Workshop options include Audition Preparation and Beginning, Intermediate or Advanced One Act Plays. At the end of each session or workshop students test their skills through performance in our Acting Out Loud Showdown. Come, be a part of Acting Out Loud and challenge the actor within! Established September of 2004 by Jenny and Jeremy Peterson to be a neighborhood theatre. The Acting Out Loud Studio offers high quality teaching of the theatrical arts. 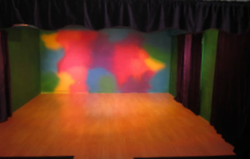 Acting Out Loud provides acting classes, spring and summer workshops, private coaching, and private lessons. The Peterson's themselves will offer performances occasionally to family and friends. It's fun to see the studio develop into a professional performance space.